Thyroid follicular cancers are one of the thyroid gland cancers. This cancer can lead to metastases to various areas of the body. We describe a patient with thyroid follicular carcinoma who after total thyroidectomy had severe hypercalcemia, increased creatinine, and thyrotoxicosis due to extensive bone metastases. The patient was a 52-year-old man who had femoral neck fracture as the first manifestation of thyroid cancer. He was hospitalized for some time after orthopedic measures because of thyrotoxicosis and deep-venous thrombosis. The study found that the origin of metastatic lesions was thyroid follicular cancer, leading to extensive bone metastases. After administering of methimazole and control of thyrotoxicosis, he was subjected to total thyroidectomy. Methimazole was discontinued immediately after surgery. One month after surgery, ultrasound confirmed that the thyroid was completely removed. However, T3 (triiodothyronine) remained high; besides the patient had hypercalcemia and increased creatinine due to dehydration. The patient was retreated with methimazole due to thyrotoxicosis, and for hypercalcemia fluid therapy, intravenous zoledronic acid was prescribed. These measures led to the normalization of creatinine and glomerular filtration rate. The purpose of introducing this case report was that these symptoms are a rare manifestation of functional metastases of follicular thyroid carcinoma after total thyroidectomy. Bone metastases of follicular thyroid carcinoma may be functional and are lytic that can lead to hypercalcemia and its complications. Thyroid follicular epithelial derived cancers include 85% papillary thyroid carcinoma (PTC), 12% follicular thyroid carcinoma (FTC), and 3% anaplastic carcinoma. Thyroid cancer in women is twice that of men. The FTC is divided into two types as follows: conventional and Hürthle (oncocytic). The most common is its conventional type. The incidence of FTC is different in parts of the world and is more common in areas with iodine deficiency. Risk factors for FTC are similar to those for PTC and include a history of radiation exposure during childhood, male gender, age <20–30 years, a history of thyroid cancer in a first-degree relative, or a family history of a thyroid cancer syndrome. Radiation exposure of the thyroid during childhood is the most clearly defined environmental factor associated with benign and malignant thyroid tumors, in iodine-deficient area., The most common site of FTC metastasis is lung and bone. An unusual form of FTC, with thyrotoxicosis, is due to the large volume of the tumor metastases (burden). Hypercalcemia is one of the complications of extensive FTC metastases to the bone. In this case report, we plan to report a FTC patient who had been diagnosed with T3-thyrotoxicosis and severe hypercalcemia and increased creatinine levels after total thyroidectomy. A 52-year-old man, after a fall on the ground, suffers from an intertrochanteric fracture of the left hip, and during the operation, a biopsy was performed from the area. In the description of pathology, evidence of metastatic lesions from prostate or kidney or thyroid gland had been reported. During the whole-body bone scan, there were other lesions in the T8–T9 and ankle and left knee areas [Figure 1]. Two months later, the patient had deep-venous thrombosis (DVT) of the left leg, and 1 month after the DVT, he had an atrial fibrillation rhythm that was detected after thyroid tests that revealed T3-thyrotoxicosis. In the thyroid examination, thyromegaly and the left lobe nodule were touched. After performing thyroid ultrasonography, a heterogeneous hyperechoic nodule was reported at a size of 78 × 50 × 42 mm that occupied the entire left thyroid lobe. The right thyroid lobe was large but without a nodule. The laboratory data are summarized in [Table 1]. 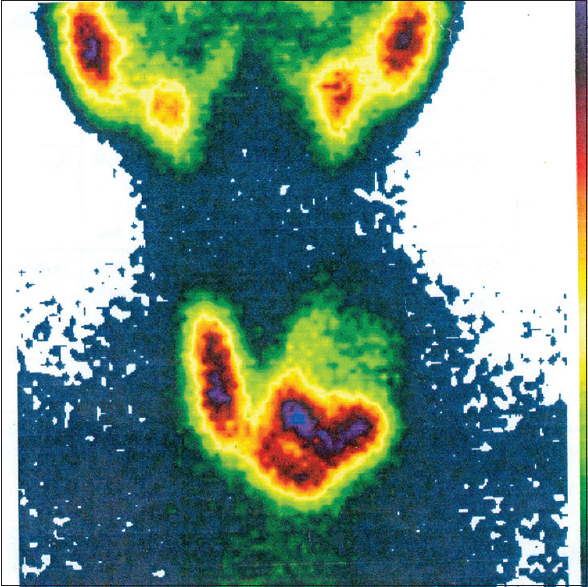 The thyroid scintigraphy with technetium-99m showed a large cold nodule in the left lobe of the thyroid gland [Figure 2]. The patient was treated with methimazole, and after endocrinology consult and performing fine-needle aspiration from the left lobe of the thyroid nodule, pathology report showed follicular neoplasm. And then, the patient underwent total thyroidectomy. The pathology report was that there was no specific lesion in the macroscopic examination of the right thyroid lobe, but the left thyroid lobe occupied a mass of 6.5 cm in diameter with relatively distinct margin, which seems to remain a narrow rim of the thyroid tissue. 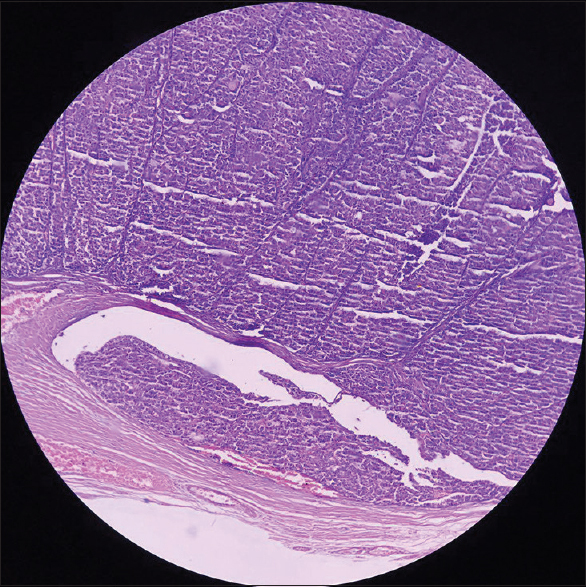 In a microscopic examination, the thyroid specimen was that sections of the capsular mass composed of follicular cells, mainly with a microfollicular and trabecular arrangement. In some areas of the cytoplasm, these cells were acidophilic and in some areas clear. The nucleus of the cells is usually round and sometimes has a nucleus of prominence, and localized necrosis was seen. In limited areas (<4 locations), evidence of malignant cell invasion of FTC, to the tumor capsule and vessels, was seen, and follicular carcinoma was diagnosed [Figure 3], and the patient was introduced to receive radioactive iodine. A month later, when he was referred to the Nuclear Medicine Center to get radioactive iodine, he complains of nausea and vomiting, bone pain, abdominal pain, constipation, anorexia, and back pain; thus, they avoided radioactive iodine administration and sent him to a hospital for medical care. On physical examination, the patient was alert with dry mucosa, blood pressure 160/90 mmHg, pulse rate 100 beats/min, number of breaths 20 times/min, sublingual temperature 37.1°C, lower and upper extremity force lowered (3 from 5), and positive tenderness of the thoracic spine; in neck examination, there was no palpable mass or nodule in the thyroid bed, and left thigh had a scar due to past intertrochanteric surgery, and the rest of physical examinations findings were normal. In laboratory data, serum calcium was 14 mg/dl, and in thyroid tests, T3-thyrotoxicosis was found. Finally, due to hypercalcemia and T3-thyrotoxicosis and pathological results, the diagnosis of functional follicular metastatic carcinoma was performed. The result of the patient's tests is summarized in [Table 1]. Ultrasound and computer tomography (CT) scan of the kidneys were normal. In the CT scan of the abdomen and pelvis and the thorax without contrast, except for a few lytic lesions in the vertebrae body, no other point was reported. Magnetic resonance imaging (MRI) without and with the contrast of the brain and the lumbar spine was normal, but in the thoracic MRI, there were several metastatic lesions in the vertebral cortex and pedicle of T4, T5, T8, T9, and T12. To treat dehydration and hypercalcemia, fluid therapy began to reduce the serum levels of calcium, calcitonin, and zoledronic acid infused, and for treatment of T3 toxicosis, oral methimazole was prescribed. Then, to prevent cord compression, the patient underwent spinal fixation surgery. Several days after surgery and 7 days after taking zoledronic acid, the patient suffered from hypocalcemia, hypomagnesemia, hypophosphatemia, and hypokalemia, which required calcium gluconate and potassium chloride and magnesium sulfate and oral calcitriol. 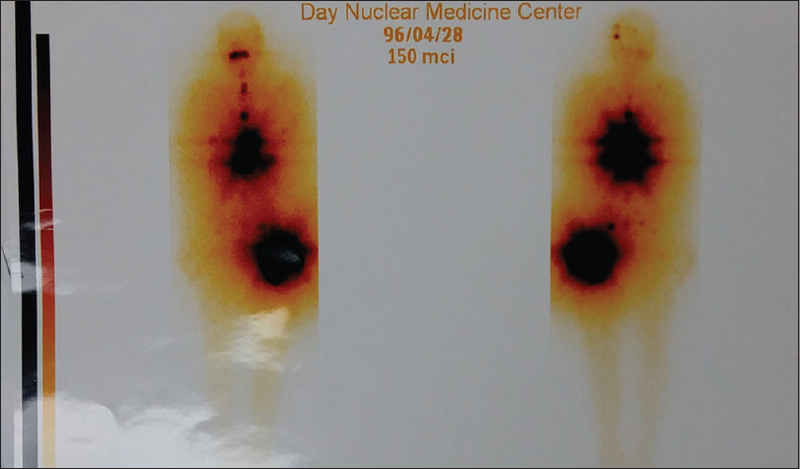 Finally, after stabilizing the patient with oral calcium, calcitriol, and methimazole, he was discharged and introduced to receive radioactive iodine. Now, 1.5 years after FTC metastases diagnosis, the patient has recurrent hip metastases and is candidate for local radiotherapy. He is able to walk with a walker, and the symptoms of thyrotoxicosis are controlled by radioactive iodine, and there is no any evidence of recurrence of hypercalcemia. The latest patient's serum levels of T3, T4, thyroid-stimulating hormone (TSH), corrected calcium, phosphor, and 25-hydroxyvitamin D were, respectively, 2.1 ng/ml, 1.49 μg/dl, 0.01 m IU/L, 9.6 mg/dl, 3.5 mg/dl, and 37 ng/ml. Kidney function was normal, but he complains of low back pain. 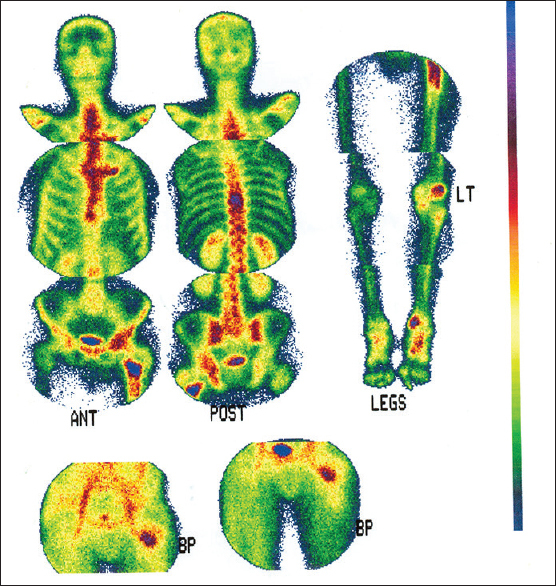 The latest whole- body scan after radioactive iodine intake was indicative of extensive bone metastases [Figure 4]. Hypercalcemia caused by malignancy cannot be attributed precisely to a specific cause. Most cases are multifactorial. Most patients with hypercalcemia due to advanced malignancy have a short life span, and patients die within 1 to 2 months. Several major mechanisms are involved in malignant hypercalcemia, which include the following: parathyroid hormone-related peptide-mediated humoral hypercalcemia, osteolytic metastases-related hypercalcemia, 1,25vitamin D-mediated hypercalcemia, and parathyroid hormone-mediated hypercalcemia in patients with parathyroid carcinoma and extra parathyroid cancers. The diagnosis can be missed because the manifestations often overlap those of the underlying malignancy and because low blood albumin may lead to apparently normal total blood calcium, despite elevated blood ionized calcium. Management includes hydration, calcitonin, bisphosphonates, denosumab, and in certain patients, prednisone and cinacalcet. Patients with advanced underlying kidney disease and refractory severe hypercalcemia should be considered for hemodialysis. Of course, the primary treatment of hypercalcemia in the field of malignancy is the treatment of underlying cancer. Mild hypercalcemia can result from thyrotoxicosis. Blood calcium levels seldom exceed 11 mg/dl, but mild elevations are found in a quarter of the patients. Patients have low PTH levels, low 1,25(OH)2D3 levels, and hypercalciuria. The hypercalcemia is caused by a direct action of thyroid hormone to stimulate bone resorption. Beta-adrenergic blocking agents can reverse the hypercalcemia. It is unusual for patients with FTC to have thyrotoxicosis caused by massive tumor burden. Although rare, functional thyroid cancer metastasis can cause symptomatic hyperthyroidism. Nearly all patients reported have had widely metastatic FTC, often involving bone among other organs., The majority of patients with functional thyroid cancer metastasis have had high serum triiodothyronine (T3), but normal thyroxin concentrations (T3-thyrotoxicosis). The mechanism is high activity of the type 1 and type 2 iodothyronine deiodinases in tumor tissues, just like when levothyroxine is given to the patient exogenously that is converted to T3. A few of these patients have also had serum TSH receptor-stimulating antibodies, the presence of which would be expected to increase the hormonal synthetic capacity of the cancer. In spite of extensive metastases, T3-thyrotoxicosis has responded well to methimazole and then radioactive iodine, and hence, hypercalcemia responded to hydration and zoledronic acid. Bone metastases of FTC may be functional and are lytic that can lead to hypercalcemia and its complications. Larry Jameson J, Mandel SJ, Weetman AP. Disorders of the thyroid gland. In: Kasper DL, Fauci AS, Hauser SL, Longo DL, editors. Harrisons Principles of Internal Medicine. 19th ed. New York: McGraw-Hill; 2015. p. 2303-5. Schneider AB, Sarne DH. Long-term risks for thyroid cancer and other neoplasms after exposure to radiation. Nat Clin Pract Endocrinol Metab 2005;1:82-91. Schlumberger MJ, Filetti S, Alexander EK, Hay ID. Nontoxic diffuse goiter, nodular thyroid disorders, and thyroid malignancies. In: Melmed S, Polonsky KS, Kenneth S, Larsen PR, editors. Williams Textbook of Endocrinology. 13th ed. Philadelphia: Elsevier; 2016. p. 449-88. Stewart AF. Clinical practice. Hypercalcemia associated with cancer. N Engl J Med 2005;352:373-9. Giovanella L, Suriano S, Ceriani L. Graves' disease, thymus enlargement, and hypercalcemia. N Engl J Med 2008;358:1078-9. Bringhurst FR, Demay MB, Kronenberg HM. Hormones and disorders of mineral metabolism. In: Melmed S, Polonsky KS, Kenneth S, Larsen PR, editors. Williams Textbook of Endocrinology. 13th ed. Philadelphia: Elsevier; 2016. p. 1287. Mallette LE, Rubenfeld S, Silverman V. A controlled study of the effects of thyrotoxicosis and propranolol treatment on mineral metabolism and parathyroid hormone immunoreactivity. Metabolism 1985;34:999-1006. Paul SJ, Sisson JC. Thyrotoxicosis caused by thyroid cancer. Endocrinol Metab Clin North Am 1990;19:593-612. Bowden WD, Jones RE. Thyrotoxicosis associated with distant metastatic follicular carcinoma of the thyroid. South Med J 1986;79:483-6. Kasagi K, Takeuchi R, Miyamoto S, Misaki T, Inoue D, Shimazu A, et al. Metastatic thyroid cancer presenting as thyrotoxicosis: Report of three cases. Clin Endocrinol (Oxf) 1994;40:429-34. Miyauchi A, Takamura Y, Ito Y, Miya A, Kobayashi K, Matsuzuka F, et al. 3,5,3'-triiodothyronine thyrotoxicosis due to increased conversion of administered levothyroxine in patients with massive metastatic follicular thyroid carcinoma. J Clin Endocrinol Metab 2008;93:2239-42.